Although I make jewelry, I’ve never otherwise considered myself to be a very crafty person. I believe I can cook…people love my cooking! And I also love to write poetry and write here on this blog. But my attempts at art are generally bad! For this reason, I try to keep projects simple! 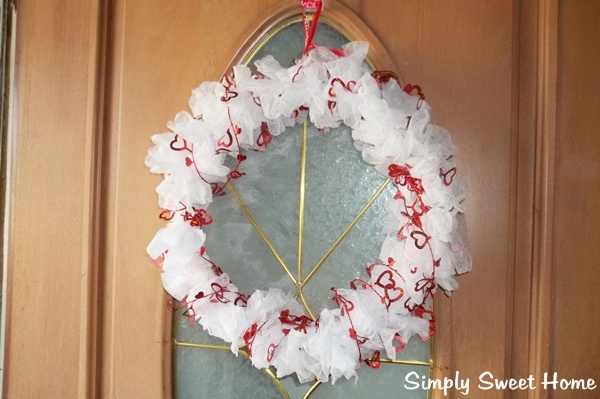 One thing that I’ve found just about anyone can do is make wreaths! 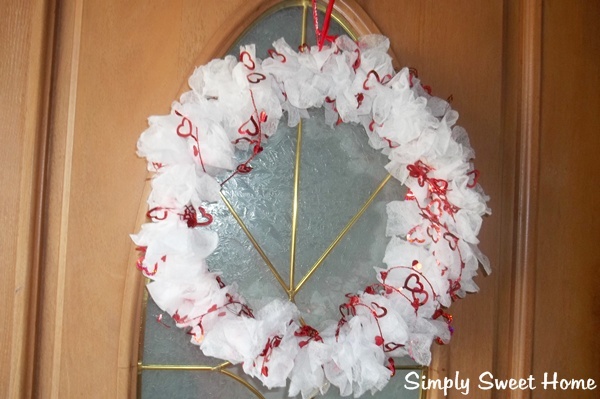 Today I’ve got a very simple Valentine’s Day Wreath that I made out of used dryer sheets! Yes, you read that right—dryer sheets! So basically today we have simple, crafty, economical project, and a form of recycling all rolled in to one post! Directions: Take your dryer sheets and tie them in a knot around the embroidery hoop. Again, it’s better to have used dryer sheets. They are easier to tie and fluff out. Keep going until the hoop is covered with dryer sheets. Then wrap garland around the wreath. Here I used a wire garland, so I was able to wrap it and secure it in place around the wreath without any tools or hot glue. However, if you’re using other types of garland it may be necessary to use hot glue. Tie a ribbon around the top for hanging, and you’re done! This turned out so cute!! Hard to believe you don’t think yourself very crafty … you fooled me 😉 Nice work, Jerri! Thanks for sharing! 🙂 Pinning!